To offer delivery and logistics services to e-comm players. 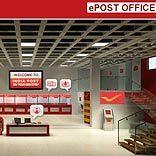 India Post, the government postal services, is actively working to offer its logistics services to e-retailers and according to reports, it would charge six per cent of the product value as delivery costs. And, there will be no extra charges for handling cash or products returns, unlike private courier companies. India Post is looking at building 20 warehouses and booking centres to cater to the e-commerce segment, and it also testing these services with a leading player in the sector. E-retail is increasingly a key focus for logistics players.